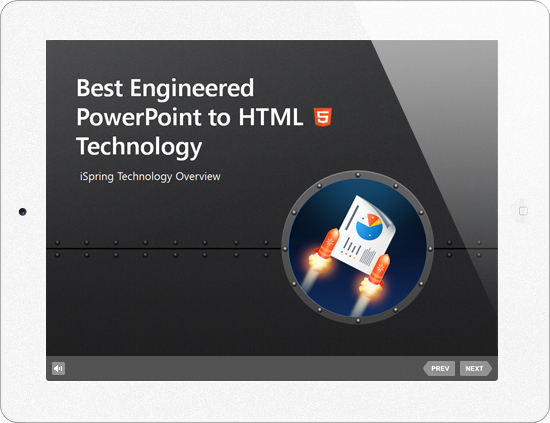 Enjoy the best PowerPoint to HTML conversion technology in the industry. – I love iSpring tools as I can use iSpring Pro to share a presentation online to those that cannot make a live scheduled presentation. – I like iSpring because it is the only PowerPoint conversion tool that creates the high quality slides that I need. PLUS they understand the move to HTML5 and are leading the way! Access all the features in one click right on your PowerPoint ribbon. iSpring Converter Pro brings together the simplicity of PowerPoint and sophistication of advanced conversion to a web-ready format. Enjoy perfect support of all your engaging PowerPoint animation effects and interactive content. Your presentation's embedded audio and video is flawlessly preserved on any device after conversion. Convert even the most complex slide transitions (even 3D) to Flash and HTML5 with pinpoint accuracy. Rest assured that your presentation's text formatting is kept intact after conversion to web-ready formats. PowerPoint offers an attractive collection of predesigned objects and themes. All of these are retained in Flash or HTML5. Whether you develop content written right-to-left or with multilingual text both are supported. With iSpring Converter Pro you can create interactive presentations in a web-friendly format in three easy steps: enhance your presentation with rich media content, convert it to HTML5 and upload it to the Internet. Add voice overs, video narrations, presenter videos and easily fine-tune presentation player appearance. Convert your presentation to a web-ready format with one click right from your PowerPoint. Once you converted your presentation you can upload it to your website, blog or to LMS of your choice. Take a look at these demo presentations created by iSpring users. They were converted to HTML5 format with iSpring Converter Pro with all the PowerPoint effects accurately preserved. Your attention will definitely be grabbed by these eye-catching slides enriched with funny graphics, impressive animations and background audio. Learn more about the real possibilities of PowerPoint by watching this interactive presentation with sophisticated branching scenarios and transition effects. Enjoy this great romantic song accompanied by beautiful mesmerizing pictures and see how iSpring does the job of preserving all animations and multimedia. – I love iSpring Converter because it coverts PowerPoints into HTML5 and doesn't require flash for viewing. So it will work on iOS devices! – Ever made a really good PowerPoint that you then want to display on your website? Check these guys out. start converting your presentations today!